October 15, 2013 Culture » Big Shiny Robot! Marvel Studios is about a month into its first television show tied to the incredibly popular big-screen Marvel Universe. Agents of S.H.I.E.L.D. 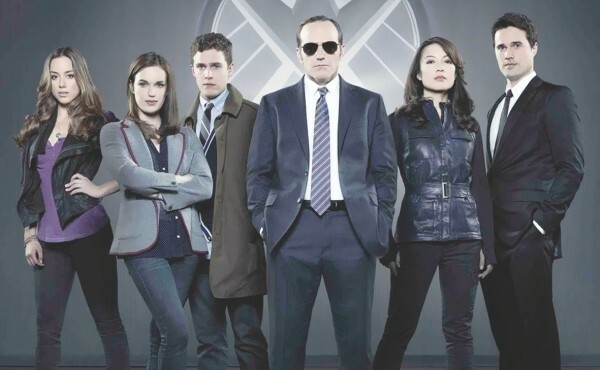 follows Agent Phil Coulson (who died in Marvel’s The Avengers in summer 2012) and his brand-new team of S.H.I.E.L.D. agents as they jet around the world, dealing with problems that are too small and insignificant to worry the Avengers, but too big for local law enforcement to handle. With Avengers writer-director Joss Whedon back supervising (at least in some small way) a television show after his fan-beloved shows like Firefly and Buffy the Vampire Slayer, hopes are high for this series—and they will continue to be high. But at the moment, there seems to be reason to be worried. After the first few episodes, it doesn’t seem as though the series has found its footing. The plots are thin; the dialogue is focused more on telling us how characters act and feel without really showing us, and some of it’s just painfully cheesy. To be honest, I’m having a bit of a hard time sticking with it. But I’m going to. You know why? I’m putting my money where my mouth is. Even if I find this show only slightly above average, I’m still going to support it, to show the powers-that-be that we need more television programming like this. I mean, if this show does well, ABC and Disney might green-light more TV shows based on beloved properties they own, like Star Wars, or even The Muppets. This is what we’ve been asking for. No, it’s not too much to ask that the show get better, and hire some writers who can take some cues from the richness of Game of Thrones or Breaking Bad, but the show still deserves our support. Same with Fox’s upcoming Commissioner Gordon-centered TV series called Gotham. Sure, Batman won’t be on that show, but we’ve got the next best thing: cops working on the streets of Gotham. One thing leads to another. But if Agents of S.H.I.E.L.D. isn’t doing it for you, there’s always Arrow. I know The CW doesn’t have the best track record with DC character shows—Smallville, to me, was close to unwatchable, and I’d love to see every copy of Birds of Prey stricken from the earth—but Arrow shows lots of promise in the episodes I’ve seen. To be honest, I think at this point it’s superior to Agents of S.H.I.E.L.D. If I were going to fix Agents of S.H.I.E.L.D., I’d bring in some of the writers who make Marvel comics great, instead of trying to have staff writers ape Joss Whedon’s television style. It feels like Whedon’s entire shtick is creating a caricature of the style of situations and dialogue Lawrence Kasdan and Steven Spielberg mastered in Raiders of the Lost Ark—particularly the scenes between Marion and Indy. Agents of S.H.I.E.L.D. is a second-rate rip-off of that style. Don’t get me wrong: As terribly written as the show is, I’m still pretty much enjoying it. Clark Gregg’s Agent Coulson is a joy to watch, and I’m excited to see these characters develop into something I might like as much as, say, Firefly. But until ABC figures out how they’re going to balance the tone between what mainstream audiences expect and the level of craftsmanship and storytelling these sorts of tales demand, they’re going to find a lot of people tuning out. Since I can’t skip ahead to the second season—when I’m assuming this show will hit its stride—I’ll just settle in for the ride and try not to take it too seriously. I think you’d do well to do the same.